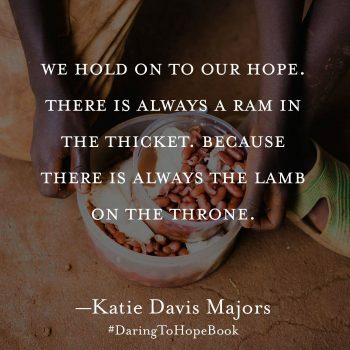 These words from Katie Davis Majors, near the end of the book, Daring To Hope, serve as a summary of sorts to her story found between the pages. If you are not familiar with Katie, when she was just 19 years old, her heart and life was changed forever. A one-year mission’s stint teaching in Uganda, led to her answering the Lord’s calling. She moved permanently there, started a ministry (Amazima, an organization that cares for vulnerable children and families in Uganda) and adopted 13 children. Friends, she is only 29 years old today. Her story of this calling can be found in her first book, Kisses From Katie. Daring To Hope, is a follow up that the Lord led Katie to write after a devastating time in her life. When she wrote this book, she couldn’t know that her book would be released within weeks or days of devastating fires, earthquakes, hurricanes…a mass shooting. Times filled with chaos, and, it would seem, no hope. She only knew that her life had been filled with the darkness of life that had broken her and brought her to her knees, crying out, “Why?” to her Lord. Not just one circumstance, but over and over, and then again. Yet, she clung to a Hope that eventually brought her through it. God knew that her story would be used to reach others at this exact moment, when so many are suffering and broken, seemingly repeatedly. When we are broken, as Christians, we can cling to the hope that He is in our brokenness. Of those who are suffering and don’t know the Lord, we can only love them through it, be it helping hand, shoulder to cry on, donating our resources, etc. so our hope gives comfort, and our Lord can bless them through us. This book made me weep and tore my heart wide open. I cannot say enough how Katie’s story has impacted me. I highly recommend this book. It’s a wonderful reminder, that He’s got your back. Please note, I was given an advanced copy as a member of her launch team. All opinions are my own. To order your copy of the book, please click here.